While many people might go to Portland to find great beer, you might consider spending a day enjoying lovely scenery and great beer in the Columbia River Gorge. 10 breweries in the Gorge have banded together to form BIG (Breweries in the Gorge), to illustrate all the beer there is to be enjoyed when you find yourself on the Oregon or Washington side of the Columbia River. Backwoods Brewing was founded in 2012 and is located in Carson, WA. We operate on a 20-barrel brew system and specialize in NW style ales. With a full, family-friendly pub, and 10 delicious beers on tap, it is a must-stop on your way to Mt. St. Helens, or up the Columbia River. Hood Rivers oldest brewpub, family owned & operated, since 1988. Small batch brews using regional ingredients. Beer true to style, served at its peak. Diverse lunch & dinner menus, fresh, seasonal, locally sourced, everything made from scratch. Kid, pet, healthy, hungry, vegetarian, friendly. River view & sunny decks. Fun, warm, knowledgeable staff! In 2007 Double Mountain opened their doors in the heart of downtown Hood River with a clear mission: make great beer for craft beer fans. The Taproom serves unfiltered and long-aged beers, brick oven pizzas, sandwiches, salads and more. Free live music weekly on Thursday and Saturday. We focus on brewing approachable beers with all the flavor. Our family friendly pub features a locally sourced menu in a beautiful wood filled atmosphere. Outdoor seating for 100 people with stunning views of Mt. Hood. Free Live Music Friday's. Unwind with us after your Gorge adventures! 11:30 to close. Founded in 1987, the independent Full Sail Brewery is perched on a bluff overlooking the Columbia River Gorge. Swing by, have a pint, grab a bite, take a tour and soak up the view! Brewery tours daily at 1, 2, 3 and 4PM. Open every day @11:00AM, serving lunch and dinner. Logsdon Farmhouse Ales brews certified organic ales in the Belgian tradition utilizing practices that have been in place for centuries. Our award winning saisons and other classic Flanders style beers are made with care utilizing local malts, hops and farm fresh fruit of the Northwest. Stop by our new Barrel House & Tap Room in downtown Hood River for a flight of our many draft offerings, to sample from one of our guest taps or pick up some bottles to go! pFriem Family Brewers is a Northwest & Belgian inspired 15-barrel brewery and family friendly tasting room in Hood River, OR. Offering a Belgian-influenced menu made with locally sourced ingredients, designed to pair with the pFriem family of artisanal beers. Solera is a small brewery located in the historic Valley Theater, in Parkdale. Try a Hedonist IPA, one of our seasonal beers, or a wild and sour fruit beer aged on local fruit. Gaze out over pear orchards toward the craggy North face of Mt. Hood from our patio. 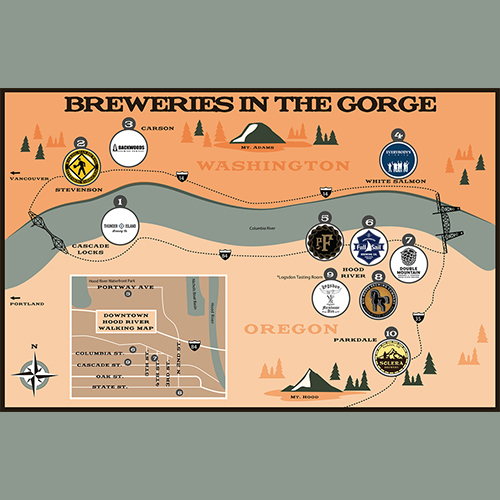 A pioneer brewery in the Columbia River Gorge, Walking Man Brewing has been crafting award-winning beer in Stevenson, WA since 2000. Enjoy our spectacular dog-friendly beer garden or cozy up inside the brewpub and share a pint with friends old and new. Our delicious menu features appetizers, burgers and artisan pizza. Open year-round Wednesday - Sunday. Please visit our website for seasonal hours. Thunder Island Brewing Co is a 7-barrel brewery and tasting room serving beer brewed with adventure in Cascade Locks, OR. Overlooking the mighty Columbia River, try a flight or pint of our handcrafted beers with lunch or dinner and enjoy the view. Well-behaved dogs are welcome on the patio. Call for hours.